What did the “chains” (= “handcuffs”) that bound Peter and Paul look like? Recently I participated in a tour that traced the route of the Egnatian Road that eventually led from Constantinople to Dyrrachium (Now Durrës in Albania on the coast of the Adriatic Sea). The trip was led by Dr. Mark Wilson. The Egnatian Way is the same road that Paul traveled on various occasions. While visiting the modern Archaeological Museum of Durrës I saw on display something I had never seen before—a set of iron “handcuffs” from the Roman Period! 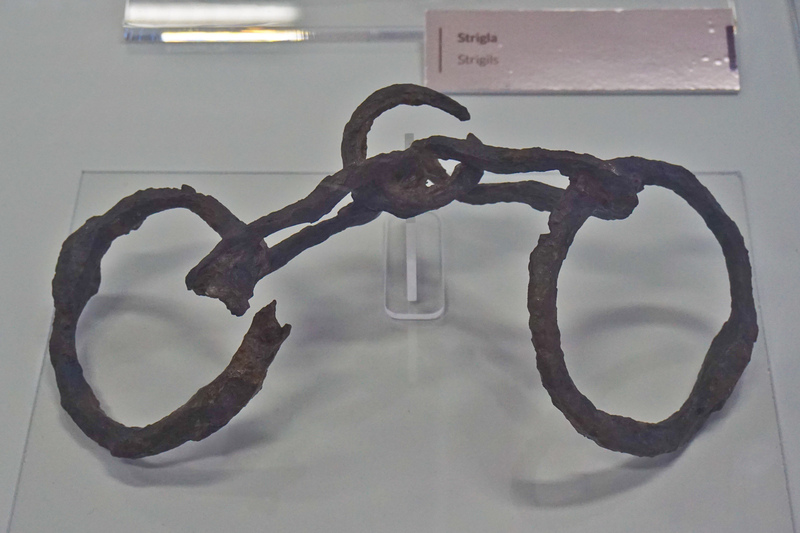 Iron “handcuffs” (= “chains”) from the Roman Period. Archaeological Museum in Durrës Albania. “Chains” are mentioned over 20 times in the New Testament! — Click on Image to Enlarge and/or Download. It is amazing how many times “chains” in the sense of wrist bands are mentioned in the New Testament—over 20 times. For example, Peter was in put in “chains” and Paul mentions his chains many times! I have listed some of the many references below. Acts 12:6 The night before Herod was to bring him to trial, Peter was sleeping between two soldiers, bound with two chains, and sentries stood guard at the entrance. 7 Suddenly an angel of the Lord appeared and a light shone in the cell. He struck Peter on the side and woke him up. “Quick, get up!” he said, and the chains fell off Peter’s wrists. Acts 16:26 Suddenly there was such a violent earthquake that the foundations of the prison were shaken. At once all the prison doors flew open, and everybody’s chains came loose. Acts 21:33 The commander came up and arrested him and ordered him to be bound with two chains. Then he asked who he was and what he had done. Acts 22:29 Those who were about to question him withdrew immediately. The commander himself was alarmed when he realized that he had put Paul, a Roman citizen, in chains. Eph. 6:20 for which I am an ambassador in chains. Pray that I may declare it fearlessly, as I should. Phil. 1:7 It is right for me to feel this way about all of you, since I have you in my heart; for whether I am in chains or defending and confirming the gospel, all of you share in God’s grace with me. Phil. 1:13 As a result, it has become clear throughout the whole palace guard and to everyone else that I am in chains for Christ. 14 Because of my chains, most of the brothers in the Lord have been encouraged to speak the word of God more courageously and fearlessly. Phil. 1:17 The former preach Christ out of selfish ambition, not sincerely, supposing that they can stir up trouble for me while I am in chains. Col. 4:3 And pray for us, too, that God may open a door for our message, so that we may proclaim the mystery of Christ, for which I am in chains. Col. 4:18 I, Paul, write this greeting in my own hand. Remember my chains. Grace be with you. 2Tim. 1:16 May the Lord show mercy to the household of Onesiphorus, because he often refreshed me and was not ashamed of my chains. 2Tim. 2:9 for which I am suffering even to the point of being chained like a criminal. But God’s word is not chained. Philem. 10 I appeal to you for my son Onesimus, who became my son while I was in chains. Philem. 13 I would have liked to keep him with me so that he could take your place in helping me while I am in chains for the gospel. Heb. 11:36 Some faced jeers and flogging, while still others were chained and put in prison. This entry was posted in Artifacts, Daily Life and tagged Archaeological Museum Durres Albania, Chains, Handcuffs. Bookmark the permalink.